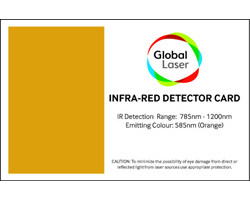 The infra red (IR) detector card is a low cost format for quick alignment of low power lasers. It allows the user to easily locate and analyse light beams in the 785-1200nm wavelength range. These detector card contain a phosphor-coated sensor area that emits clearly visible light when illuminated by NIR, or IR sources. Proper function of this card requires charging it with visible light before use. Please note that these detector cards are not intended to be used as laser beam blocks, and appropriate safety measures should be taken when working with laser beams.